Aside from politicians and NFL executives, the profession I least admire is meteorologist. These feel-good, ear-to-ear smiling types are oh-so-quick to point out when their forecasts are accurate. But what really floats their boat is to speculate on a coming weather event, prognosticate the worst and send their viewers and listeners into a positive frenzy. Snowmageddon, AKA “The Blizzard of ‘15” offered tri-state meteorologists everything they needed to construct multi-day, 24×7 coverage of what, essentially, ended up a total non-event. As early as Sunday, we saw intrepid weather teams interview one after another scared homeowner pushing a snow blower in his shopping cart (“Golly, I am so grateful to have gotten one of the last ones available,” he’d pant). Or, we’d see another StormTracker standing in a Queens side street, and declare, “Tim, look at this. It’s only begun snowing lightly and already you cannot distinguish where the curb ends and the street begins. Imagine what it’ll be like in 24 hours when the full force of Winter Storm Juno hits!”). BTW, why must they name these storms? 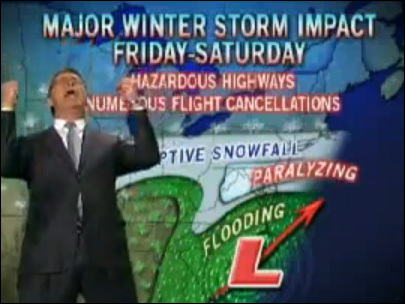 No one, though, can top WCBS-TV lead meteorologist, Lonnie Quinn when it comes to Hollywood theatrics. Straight out of central casting, Lonnie will get excited when the forecast is 72 degrees and sunny. But, when the mother of all blizzards is bearing down on his neck of the woods, Lonnie goes positively postal. He rolls up his sleeves, pulls down his tie and runs from one map to another (thereby generating tiny sweat beads which begin pour down his forehead and well up under his arms). This guy wants us to know he’ll do whatever it takes to keep us safe. All the hype worked like a charm. Thousands of flights were cancelled, all major rail lines were shut down and the New York subway system was closed. Today, when it was oh-so-apparent they’d missed their predictions by some two feet, all the meteorologists fell back on the same line, “Well, as New Jersey Governor, Chris Christie said just moments ago, “It’s better to be safe than sorry.” And, I agree (but with a huge caveat). The reckless weather forecasters scared the bejesus out of the metropolitan area. They forced homeowners to buy provisions they had no need to buy and they cost area businesses countless hours of productive work. Name one other profession that can miss the mark by two feet and not be held accountable. A doctor would lose her license and house contractors would be fired (“Sorry, Mr. Smith, but your roof is two feet too long.”). But, not meteorologists. No one holds them accountable for the havoc they wreak. So, here’s a suggestion for someone to act on (or not). Create a website called www.weatheraccuracy.com and let’s rate our favorite, and least favorite, forecasters. On a scale of one to 36 inches (which is the amount of snow he predicted), I’d give Lonnie Quinn a zero. Hilarious, Abbie. Thanks for sharing. Great analysis, Michael. Thanks. I must check the Jon Stewart clip. Amen, especially about Lonnie Quinn. The local stations rely on research that tells them that the weather reports are one of the most popular (and therefore lucrative) segments. So they have jazzed them up with mannequins like Lonnie Quinn who take the weather information the stations purchase from a vendor and put on a pantomime act to pretend that somehow Channel 2’s vast resources have been poured into space age weather analysis. The fact is, we had a lot of snow. Traffic and transit would have been affected, and schools likely closed anyway. I saw one meteorologist say “we were only off by 75 miles, which is amazing.” That’s the same spirit shown by those who got a space vehicle to land on a speeding comet. I don’t think it is fair to expect 100 percent accuracy. But drop the pretense. Lonnie Quinn with his sleeves rolled up in front of a computer screen is no more credible than an actor hired to promote a medical device by wearing a white coat. I think I read that New York businesses as a whole lost more than $1 billion in lost productivity thanks to Lonnie Quinn & Co. And, I agree with your wife, Jason. The real winners in all of are the local retailers who sell every last piece of merchandise to panicked consumers. Exactly, how much business was lost yesterday because of the hype? I took my daughter sledding in the park. She wanted a bagel afterwards. Bagel place closed. Every other cafe-type place within a 5-block radius except a greasy spoon I usually avoid. The waitress was working VERY hard and said it was both a blessing and curse to live a few blocks away. I think Jason is right about the grocery industry, with a special shout-out to Trader Joe’s. On Monday at 12pm there was a block-long line at the TJ near downtown Brooklyn. I went to the natural food store 3 blocks away and did my buying there. No line and lots on sale. She offered me the job. Eh, “other commitments”…. Weathermen are a special breed…I too watch WCBS and agree Lonnie is a piece of work, but I get a kick out of the Morning guy…the ambiguously gay John Elliot…his antics are very special.